Icy's Blunt Pencil: Bloody Parchment: The Root Cellar and Other Stories out now! Bloody Parchment: The Root Cellar and Other Stories out now! I've been quite excited about this for some time, but I've finally pleased to announce that I've got a story in the new Bloody Parchment collection, The Root Cellar and Other Stories! Isn't that a fabulous cover? I'm proud to be associated with anything that looks like the Bride of Frankenstein. Edited by Nerine Dorman, the collection brings together entries from the South African HorrorFest Bloody Parchment short story competition, including the winning entry by Toby Bennett, and the runners up, Anna Reith and Chris Limb. The collection also features stories by Diane Awerbuck, Simon Dewar, Zane Marc Gentis, Stephen Hewitt, Benjamin Knox, Lee Mather, Glen Mehn, S.A. Partridge, and yours truly! My story is named Protection, and tells the story of a werewolf family just trying to get by in a besieged society. Featuring a fight sequence and a shadowy small town run by mysterious priests, it's probably more in the vein of dark fantasy than straight out horror, but I really enjoyed writing it, inspired as I was by A Night on Bare Mountain by Mussorgsky. I hope everyone enjoys it! 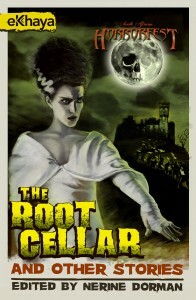 You can now buy The Root Cellar and Other Stories here from Amazon! "... a werewolf family just trying to get by in a besieged society." Oh, I like that plot, Icy. The Guns of Retribution available again!